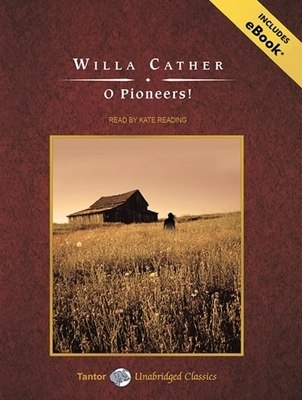 "The history of every country begins in the heart of a man or a woman," writes Willa Cather in O Pioneers The country is America; the woman is Alexandra Bergson, a fiercely independent young Swedish immigrant girl who inherits her father's farm in Nebraska. A model of emotional strength, courage, and resolve, Alexandra fights long and hard to transform her father's patch of raw, wind-blasted prairie into a highly profitable business. A gripping saga of love, murder, greed, failure, and triumph, O Pioneers vividly portrays the hardships of prairie life. Above all, it champions the belief that hard work is the surest road to personal fulfillment. Described upon publication in the New York Times as "American in the best sense of the word," O Pioneers celebrates the men and women who struggled to build a nation that is both compelling and contradictory. Stage actress Kate Reading has been a freelance narrator for over twenty years. She has received multiple Audie Awards and nominations, as well as numerous Earphones Awards from "AudioFile" magazine, which has named her Narrator of the Year and, for two years running, Best Voice in Science Fiction and Fantasy.